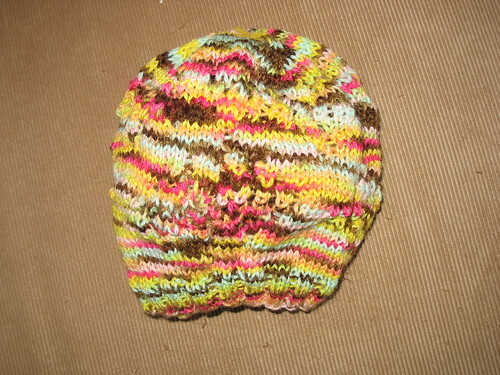 So, I decided to make a hat with my stash yarn. And having some attempts that I am not ready to talk about yet with berets, I decided the Fountain hat was a good compromise - being beret-like, yet cloaer to hats I have successfully constructed (Interweave, Spring 2008, but the pattern is up on Knitting Daily). I used the Three Irish Girls Adorn Sock yarn, which was perhaps not the best choice. 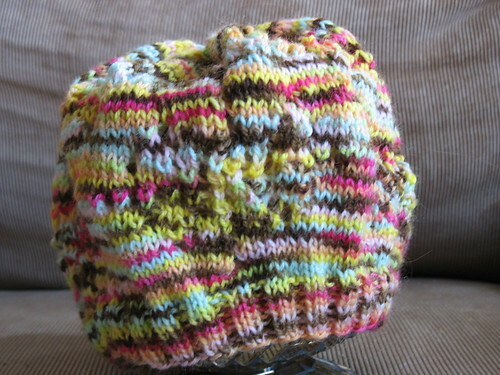 The yarn is lovely, but the pattern would likely show better with a more subtle colorway. I love how it turned out, but certainly if I really wanted people to see the pattern, a different color would have done that better. As you get to the top, it seem like it's going to be too poofy - like you are accidentally making a beret without any decreases, but it works out fine. It's a very nice hat design.